Syrians offer mostly tongue-in-cheek 'advice' to Ukrainians fighting to ward-off Russian takeover in Crimea. The revolution in Kiev has been widely covered in the Arab press, which has seen comparisons to the Syrian revolution and claims that the Ukraine – like Syria – is another arena of the new "cold war" between Russia and the U.S.
At the same time, the Ukrainian revolution was also highlighted on Syrian Facebook pages, especially those of many Syrian citizens. 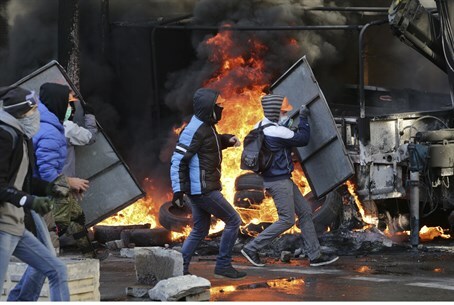 They likewise drew similarities between their revolution and that of the Ukrainian people, but the tone taken by most of them was humorous or sarcastic, reports the Middle East Media Research Institute (MEMRI) Tuesday. Thus, for example, Syrian activists from Homs started a virtual Facebook event titled "Give Advice To The Rebels Of Ukraine And Venezuela." The page received many “likes” and thousands of Syrian oppositionists filled it with advice (most of it sarcastic) for Ukraine's rebels based on their experience rebelling against their own regime. Some of the posts on the "Give Advice To The Rebels Of Ukraine And Venezuela" Facebook Page were serious in their tone. An activist named Siran Hajj ‘Ali wrote: "Do not carry weapons, even if three quarters of Ukrainians are killed. Keep your revolution nonviolent." Another piece of advice for the Ukrainians was to prepare for the possibility of being displaced in case the regime escalates violence, as it did in Syria: "Pack a small bag [in advance] with your personal documents and all basic necessities, since at the moment of flight you won't have time to do anything." An individual calling himself "Nasser the Syrian" advised Ukrainians to buy generators and store fuel in case of blackouts as a result of a siege. However, notes MEMRI, most advice on this page was ironic and sarcastic. For example: "Advice for our Ukrainian brothers: Prepare your gas masks in case the Ukrainian Ba'ath regime decides to bomb you with chemical weapons, and stay away from the windows." Some posts used the opportunity to mock the claim that Shia fighters from Hezbollah and from the Iran's Islamic Revolutionary Guards Corps were only in Syria to defend the Tomb of Zaynab in Damascus, which is sacred to Shia Muslims. One post said: "If you have a Tomb of Zaynab, you must demolish it immediately and get rid of it, lest foreign [forces] arrive to defend it." Another post mocking Hezbollah for this reason portrayed Nasrallah as saying: "We will send [military] reinforcements to Kiev to protect the Tomb of Natasha." Some advice reflected self-criticism by Syrian activists: "To the free Ukrainian rebels... Do not make the same mistakes we made. Make new ones!!!" Criticism was also leveled at Syrian opposition institutions, chiefly the Syrian National Council and the National Coalition of Opposition and Revolutionary Forces. Thus, for example, a post addressed to the Ukrainians read: "Do not believe anything called a 'coalition' or 'national council'". Syrian humor also appeared on other Facebook pages related to the Ukraine revolution, adds MEMRI. For example, a page called "Jokes and Puns of the Syrian Islamic Revolution" featured a picture of National Coalition head Ahmad Jarba looking like a Ukrainian and with a Ukrainian name: "Head of Ukrainian National Coalition, Ahmadov Jarbanov". Similarly, the Facebook page "The Ukrainian Revolution against the Ukrainian Tyrant" shows the founder of the Free Syrian Army, Riad Al-Asaad, with a Ukrainian appearance and name, and with the headline: "Lieutenant Colonel Riadakov has announced his defection from the Ukrainian army and the establishment of a free army."